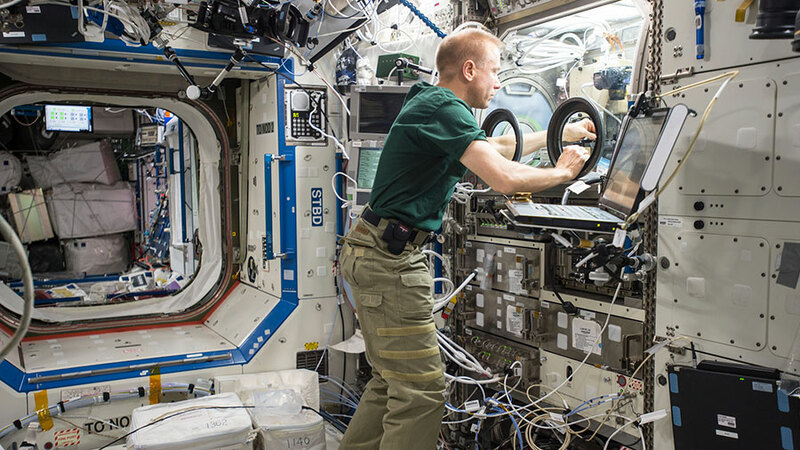 Astronaut Tim Kopra works on a combustion experiment inside the Microgravity Science Glovebox. The Expedition 46 crew members are wrapping up their work week on different types of research including botany, bone loss and pilot testing. The crew also checked for pressure leaks, worked on life support gear and continued cleaning up after a spacewalk. Plants are being grown on the International Space Station so future crews can learn to become self-sustainable as they go farther out in space. Commander Scott Kelly took photos of the botany work today as part of the Veggie experiment. The commander started his day in Japan’s Kibo lab module with British astronaut Tim Peake stowing a Cyclops satellite deployer and checking for leaks in the airlock. Kelly also joined Flight Engineer Tim Kopra cleaning up after installing the refurbished Carbon Dioxide Removal Assembly the day before. Cosmonaut Mikhail Kornienko participated in a couple of experiments today looking at bone loss and pilot performance in space. He also checked for pressure leaks before the Progress 61 supply ship undocks March 29. His fellow cosmonauts Sergey Volkov and Yuri Malenchenko are still stowing tools and gear after Wednesday’s spacewalk. Dear Members of ISS , as a simple for earth it seems to me that veggies are very important!! after we breathing , we have to eat!!! And especially the fresh food should be valued in a Space conditions? There has any traces of living creatures on Mars. There will be other creatures to inhavit such a dry environment by preference on Mars. That reminds me, the jellyfish of some kind on the earth is likely to live without water.